Walsh Construction Company is a Chicago-based general contracting, construction management and design-build firm. Walsh is recognized as the largest construction firm in Chicago according to Crain’s Chicago Business, as well as one of the nation’s top 15 contractors according to Engineering News-Record (ENR). The firm has experience with a wide variety of building, civil, and transportation sectors. 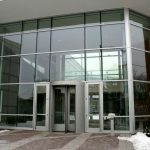 Maintaining regional offices across North America, Walsh Construction operates using Union Labor and Union Subcontractors. Walsh Construction’s corporate headquarters is located in the West Loop neighborhood of Chicago. The headquarters includes a large, east-facing lobby with 19-feet-tall exterior windows and a gymnasium with several 12-feet-tall, south-facing exterior windows. All windows provide excellent views to the surrounding campus and historical structures throughout the West Loop. Illinois Window Shade Company was tasked with providing heat and glare control to the Walsh Construction lobby and gymnasium while preserving the outstanding views to the surrounding campus and historical structures throughout the West Loop. In the east-facing lobby, the 20-feet-tall exterior windows were allowing unacceptable glare levels for administrative staff needing to operate electronic visual displays (i.e. TVs, computer monitors, etc.). The windows also transmitted high levels of solar heat gain, which made the lobby uncomfortable in the AM hours for both staff and guests. The heat levels were also a drag on the facility’s energy bills. The gymnasium includes four south-facing, 15-feet-tall windows approximately 9 feet above the floor. These windows were also allowing unacceptable levels of visual light and heat transmission. The extreme glare coming from the south facing windows were disrupting gym activity and, during the summer months, the heat levels also became unacceptable. Walsh Construction needed a solar shading system that would help create an environment for clients and staff that was indicative of their commitment to design excellence. – All fascia made from 4″ extruded aluminum. White fascia was used in the lobby and custom-painted fascia matching Walsh’s green logo was used in the gym. Illinois Window Shade Company designed a solar shade system that successfully manages the solar and visual light transmittance at the Walsh Construction Company headquarters. 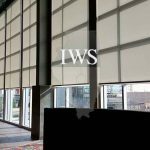 The Illinois Window Shade Company solution specifically addresses Walsh’s needs by providing a motorized shade system that promotes a comfortable and energy efficient environment. A total of seven Illinois Window Shade Company Motorized Shade Systems were used in the lobby and gymnasium exterior windows. The Motorized Shade Systems were equipped with a woven mesh shade (Mermet E7503-3% White/Linen #0220) and driven by RTS 50452 Silent Motors. The shades were concealed using matching 4″ square fascia. The woven mesh shade thoroughly reflects solar heat, allowing internal building controls to more efficiently regulate temperature levels throughout the facility. The shade allows a high level of natural light into the room, reducing dependence on artificial light and providing a much more comfortable environment for staff and visitors. The RTS motorization allows staff to control the very large and out-of-reach shades with the touch of a remote control button. The quiet motors used in the lobby allow staff to operate the shades without disrupting normal business operations. The solar shade solution at the Walsh Construction Headquarters looks beautiful, is easy for staff and guests to operate and produces measurable results with respect to the light and heat levels in the facility.